Maybe you’re wondering about the lack of new articles? Maybe you’re thinking “Why isn’t the lazy bum out there looking for interesting places to write about? What are we paying him for anyways?” Errm! One thing that has surprised me about Southern Thailand, is the clearly defined seasons. I spent twenty-six years living near the central west coast of Peninsular Malaysia – only about 800kms south of here – and sure, there were seasons, but not as dramatic as here. Most days there was some sun and some rain. Early in the year there was usually more sun than rain, and vice-versa later in the year. There were some extremes. Torrential rain would often fall for an hour or so and cause total chaos. Flooded roads were common. Landslides less so. Earlier this year I was complaining about the extreme heat. We had about three months of almost dry, sunny weather, with temperatures regularly in the upper thirties or lower forties. I like sunshine. I like it hot. But that was a bit extreme. 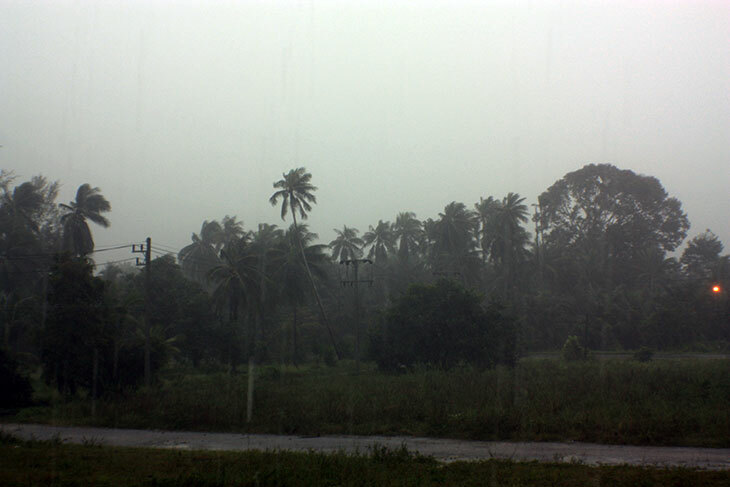 Whereas, around this time of the year, rain is frequent and sunny days are rare – but savored if possible. On my last two day trips, to Krabi and Trang provinces, I was lucky. The weather wasn’t great, but I seemed to dodge the showers. Since then, things have deteriorated. Last Thursday I needed to go to Surat Thani. Well, actually, the train station, which isn’t really in Surat Thani, but the adjacent town of Phunphin. Some friends in Australia needed train tickets and discovered they couldn’t be bought online. I’d tried to buy them about a month ago, only to be told the advanced booking period was sixty days. At the time, there were only forty-seven days before the intended travel date, but it seemed that forty-seven was sufficiently close to sixty that they couldn’t be bought. Last week there were only twenty-or-so days, so that was okay. Life here can be strange. The two tickets, for two adult human beings, in the same compartment of the same train, were different prices. I didn’t ask. Right, right, so when I went to Phunphin, I took my camera. Not to photograph the station. Thailand has some attractive ones like Hua Hin and Kan Tang but Phunphin is not one of them. Functional, I think you’d call it. So, I’d planned a small side trip to see something that sounded interesting. But, despite the positive-sounding forecast, the day was so overcast and cool, it was a headlights on, aircon off day. No point in sightseeing. Something was threatening. Just as I arrived home, it started raining. Heavily. And then heavier. Right through into Friday morning. By some miracle it stopped for about thirty minutes, which was just long enough for me to scoot to the Post Office to send said tickets on their merry way by courier. And then the rain restarted. I’m afraid I’ve run out of adjectives. “Torrential” would be something like a light shower compared with the rain we have been experiencing. “Biblical” might do it. In fact, I joked on Facebook “Ark under construction.” Friday and Saturday we received upwards of thirty-five centimeters of rain each day. For the metrically-challenged that’s more than a foot a day. Someone had a bright idea! Okay, don’t nag. 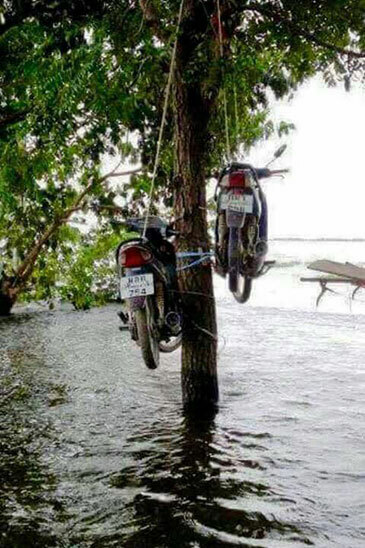 Needless to say I saw some extensive flooding. Most rivers had overflowed their banks. Most fields were flooded. The new Tesco Lotus shopping center in Sichon had become an island anchored to the main highway. But, to be honest, it wasn’t as bad as I’d expected. I only found one flooded road, which Bert plowed into with glee, sending towers of water up above the roof level. It reminded me of my sailing days, and those were a long, long, long time ago. In fact I think it was Queen Victoria who introduced me to the sport. Okay. Weather. So, it seems like Sunday morning was the eye of the storm. A brief interlude before a repeat performance. Since Sunday lunchtime, until now – Monday evening – there has been continued and continuous rain, most of it über-torrential. Which means we’ve received about one meter of the stuff in the past four days. The weather map looks downright scary. 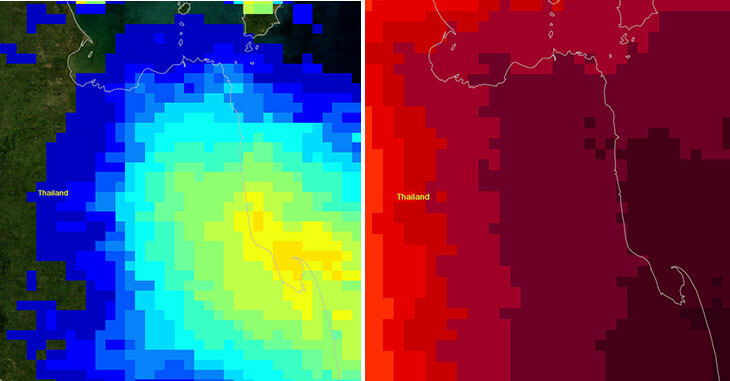 Below, on the left, is yesterday’s heavy rain, on the right is tomorrow’s prediction. What is that red stuff? Buckets of blood? And the dark red means the buckets will come down too? Only time will tell. The long range forecast has rain every day until at least December 18th. – which is as far as it goes. Needless to say, the situation is worsening. Sadly, in the region, at least eleven people have lost their lives. Whole towns are now under water. Khanom town? I’ve no idea. I’m staying put for now. Unless the sea decides to get angrier. 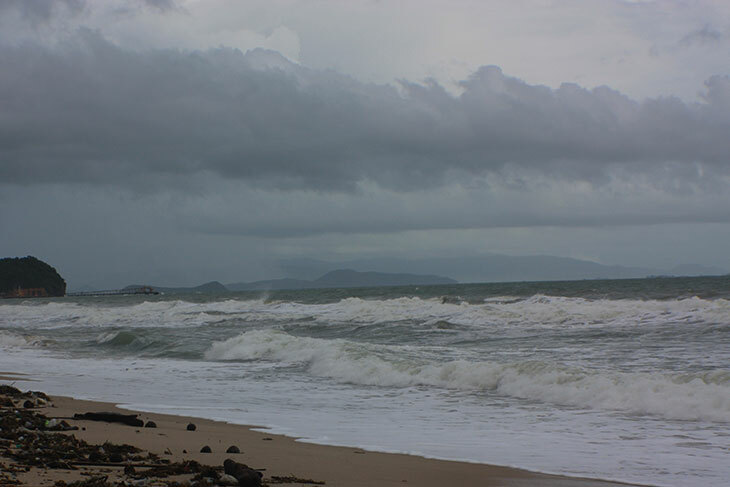 In the background is Koh Samui, which you can get to, as the ferries are still running, but you can’t get around as the roads are all flooded. 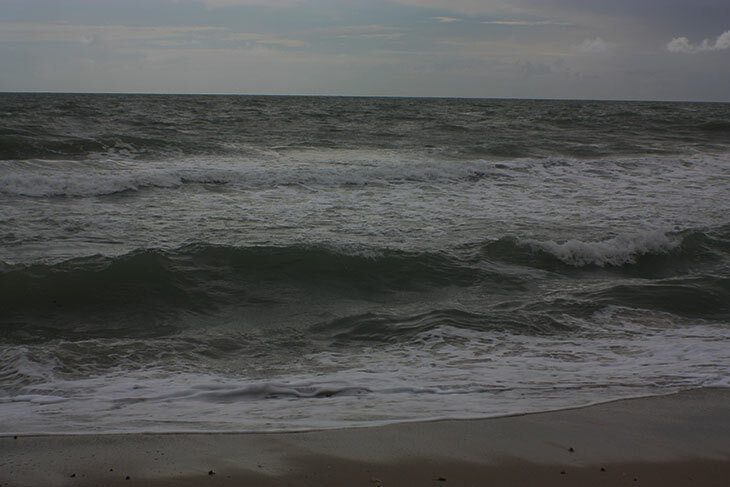 At high tide, which it wasn’t when I took the pics., the sea has been reaching the upper-limit of the beach. Two meter waves have been normal. But, for now, it’s far enough away that I don’t need to worry… about eighty meters horizontally but only a meter-or-so vertically. 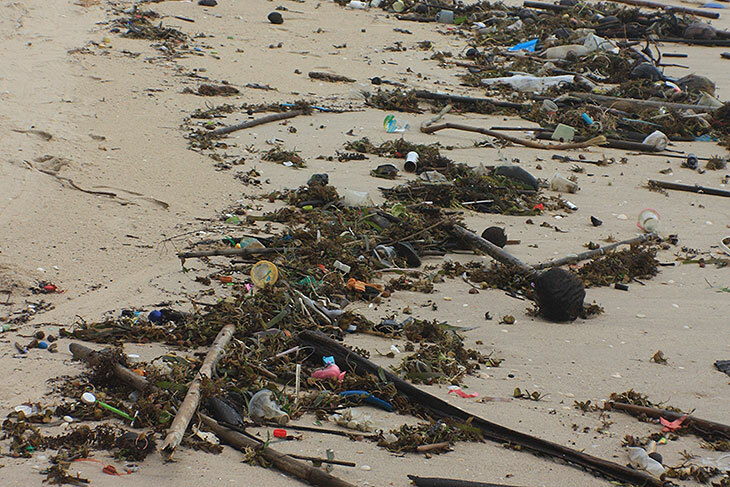 As you can see, a lot of garbage has been left on the beach. Hopefully, that will get washed out again. So, for now travel stories are on hold. Let me see what else I can twitter about over the next few days.